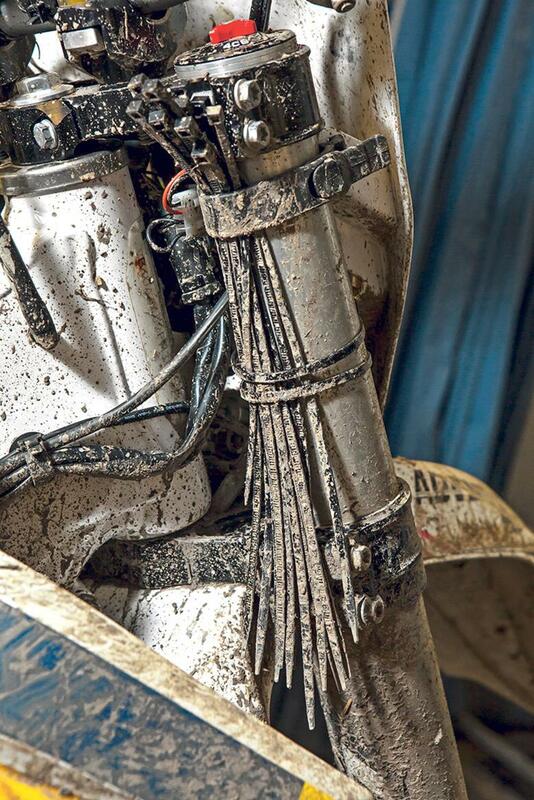 While I was racing in the Dakar Rally the con-rod came out of the bottom of my BMW G450’s crankcase. I wasn’t going any further so I had to change the engine in the dunes with this kit. These tools can fix anything on my bike and I practise with them before every race. Before the race I tighten everything myself using the tools in this kit, so I know I can undo it if I have to. If a guy in a workshop with a rattle gun tightens everything, you’ll never be able to undo anything. With a bit of luck I won’t need this kit in a race, but in case I do I’ve managed to get it as light and compact as possible while still being able to perform every job – only practise and preparation will help you do that. This is an important bit of kit when you are far from assistance. My chain breaker tool is small and compact and I can use it to double up as extra leverage for my ratchet if necessary. I also carry two spare chain links. 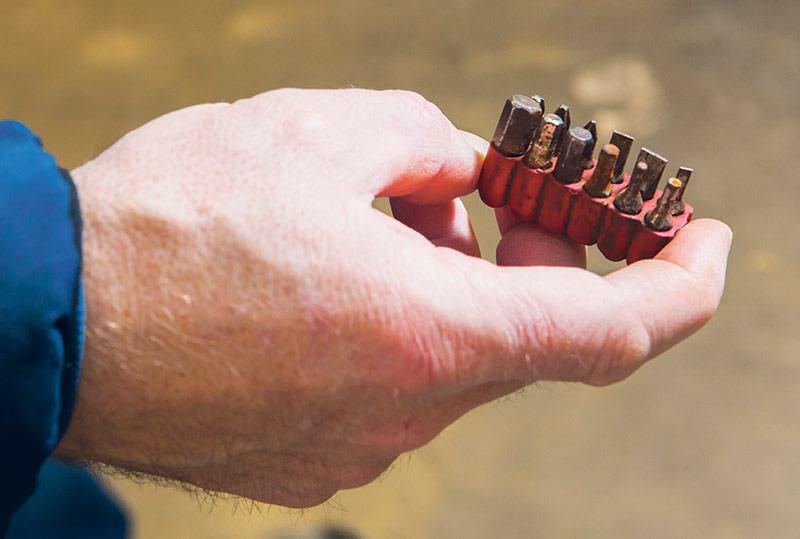 There are firms out there who make small, lightweight travel chain breakers. 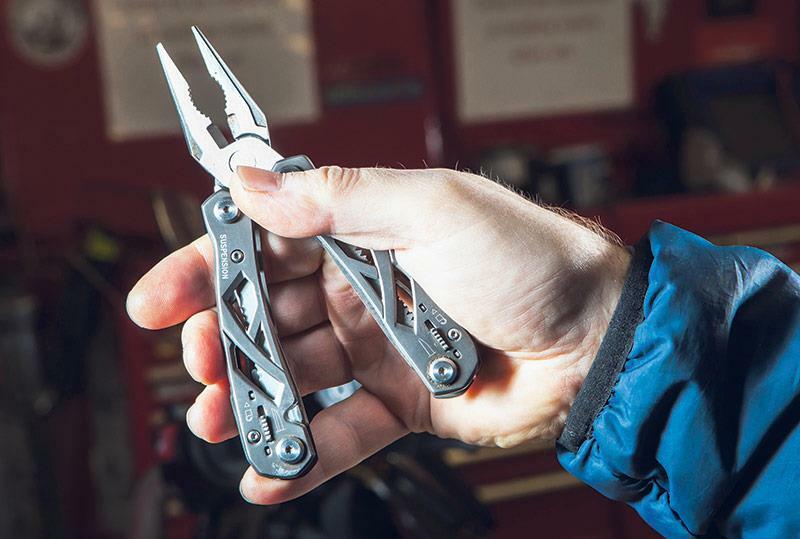 Make sure you opt for one of those as most breakers on the market are big, heavy and chunky things best suited for your garage, not your bike’s tool roll. I only use one lever because I can use something else – such as a ratchet – to hold the tyre in place while I lever it off with this. 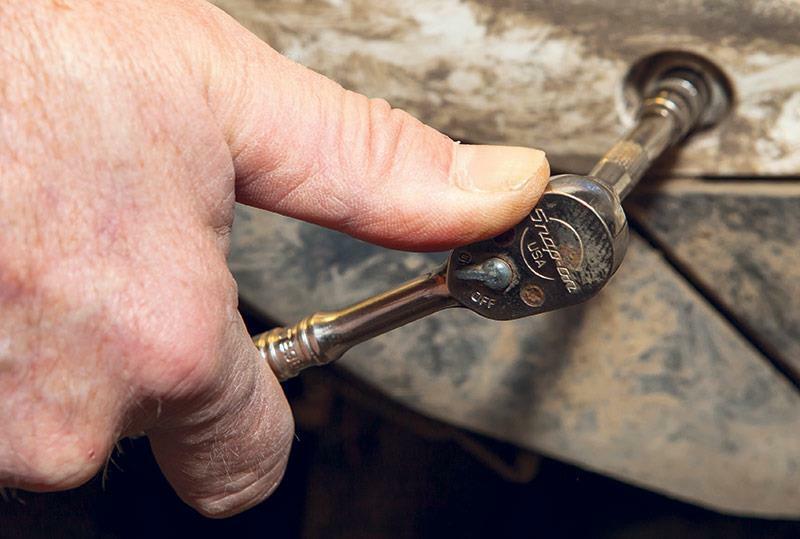 Practise changing tyres with one lever and a ratchet, once you’ve done a few you’ll realise you don’t need 20 tyre levers under the rim. My lever also doubles up as my rear spindle spanner. This Motion Pro lever is alloy and super- light. It’s not going to be as strong as steel so I make sure I’m the one to do up my spindle bolt before I set off. You can just about fix anything metal with this little tube of magic. 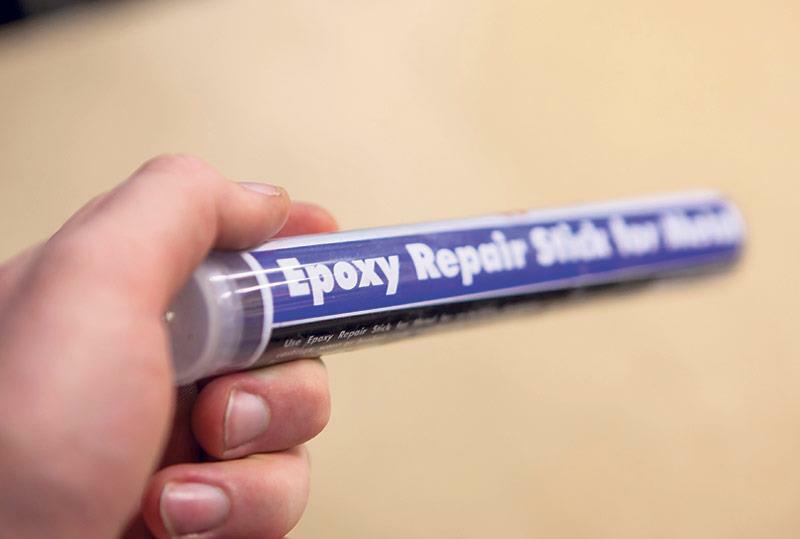 Two-part epoxy is a life-saver if you need to fix cracked metal, especially if it’s something containing fluid and you have an oil or coolant leak. 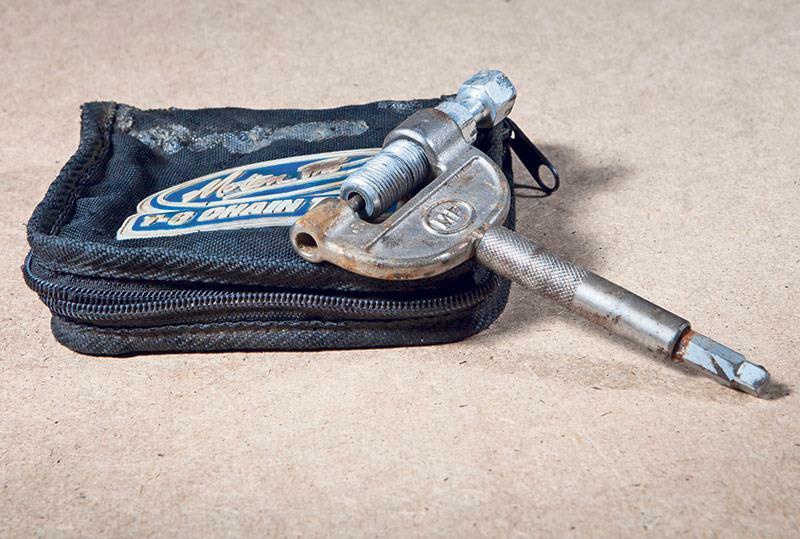 I once patched-up a smashed clutch with this and a couple of zip ties in an emergency repair. It is fantastic stuff and I’d never leave it out of the on-board toolkit. Mix it up and you’ll soon get yourself out of trouble when you are a long way from base. Everything is ¼in drive so I don’t have to take two of anything with me on the bike. I want my kit small and compact and definitely don’t need a massive ratchet taking up precious space or adding unwanted weight. I personally do up every bolt with this little ratchet before I race, that way I know I can undo all those bolts again if I have to. I use the extension piece to get to awkward places and the sockets I carry will undo every nut and bolt on the bike. If there are bigger bolts on your bike you can always change them over to a smaller head size at a fixings shop. 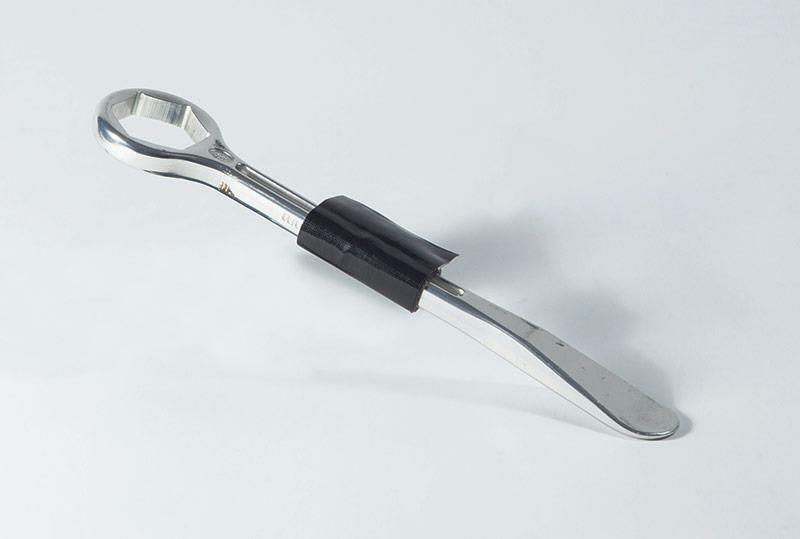 Buy the best quality ratchet you can find as you want to be able to rely on it to get you back on track. You could get away with just a pair of pliers instead of one of these if you want to be really strict. These really are just boy’s toys, but they do come in handy and can save you taking extra and unnecessary tools. If you’re going to use one then just make sure it’s not overflowing with superfluous stuff. I particularly like this one as it’s light and there’s not too much on it. I actually keep it closer to hand than the full toolkit as it saves getting the whole set out if something minor breaks. 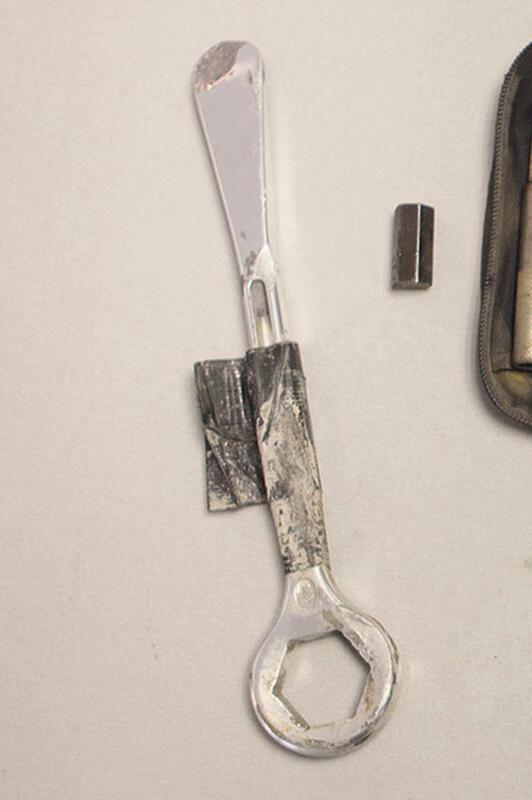 It comes with a couple of screw drivers, a knife, wire cutters, pliers and scissors for your nails. Oh, and the most important part is a bottle opener… for the end of the race, of course. Allen keys are big and heavy. So a good trick is to find which ones you actually need and cut them down to fit in with your socket set. As I’ve cut mine down I can just slot it into one of the other hex sockets and use it with the ratchet, which saves time, space and weight and it’s far easier to use. Some guys will just carry a full Allen key set, but that’s unnecessary. I once broke the entire fairing bracket and front end of my bike during a race. So I used tie down straps to hold the whole subframe together. I always carry two of them. They’re so important as there’s only so much a cable tie can fix. Plus, they can also double up as tow rope and are perfect for towing a broken-down bike. I need to use up a minimum amount of space, so instead of a big, wide roll of duct tape, I wrap enough round my tyre lever to get me through a race. Doing that saves me space and weight. But if you want to keep more tape with you then you can wrap it around anything, it could even be a pencil, just to keep the size down. The key is packing small.